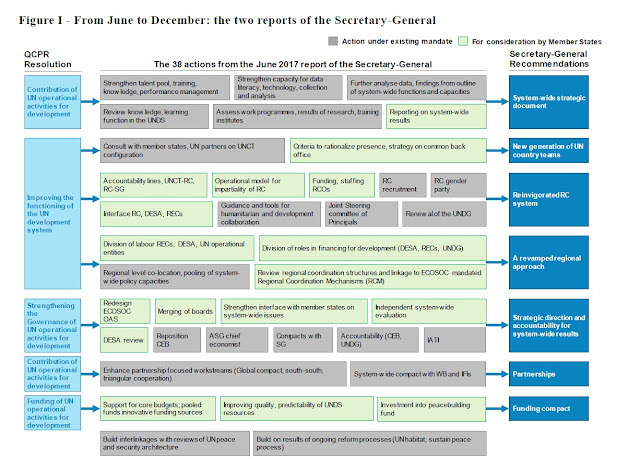 In the runup to Christmas, I have to admit my priorities were elsewhere than reading the second report on the ‘Repositioning of the UN Development Agenda’ which the Secretary-General had published. I am sure I was not the only one focusing on the holidays. The new year is now with us and so I thought I had better catch up. Background to this report and its predecessor is that the UN needs to reorganize around the 2030 Agenda and the Paris Climate Agreement and to retool to help accelerate implementation. In addition, with the Trump Administration cutting back on its financial commitments being an urgent driver for change. This has been made perhaps easier because of the changing leadership at the UN in the last couple of years. Not only do we have a new Secretary General – a former head of state – but also a Deputy Secretary General who played a significant role in the development of the Sustainable Development Goals. In the Agencies and Programmes we also have new heads at UNDP, WHO, IFAD, UNESCO, UNICEF, World Food Programme, UN Women, UN-Habitat and UNEP. In the UN Secretariat we have a new Under Secretary-General for UN DESA and soon new Deputies. This new team offers the Secretary-General a great opportunity to change the direction of the organization and to retool it for the twenty-first century. The Secretary-General has in his new Report recognized that ‘prevention’ is better than dealing with the resulting problems after they have happened. In the area of climate change helping counties to build their resilience is critical. It also is the theme of the ECOSOC Special Meeting this year ‘Towards sustainable, resilient and inclusive societies through participation’ in May. Also in July the High-Level Political Forum will be on a similar theme that of ‘Transformation towards sustainable and resilient societies’. underpinning all the other changes, a new Funding Compact between Member States and the United Nations development system. I can't help but put a plug for the Nexus Conference April 18-20th in Chapel Hill in North Carolina which is trying to do some of this in bringing together the UN, governments and stakeholders around the interlinkages between the climate, energy, water, food agendas looking through an Urban lens. There need to be more rewards for working together across issues, Agencies, and Programmes. i. Strong sustainable development professionals, with a deep understanding of the conceptual shift to the 2030 Agenda and of national planning processes. ii. Able to draw on the expertise and assets of the entire UN system to address Member States’ development priorities. iii. 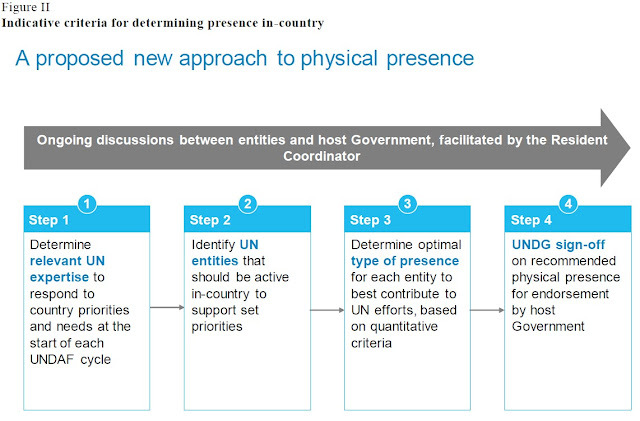 Better prepared to work across the development–humanitarian-peacebuilding continuum. This includes a strong understanding of relevant United Nations normative frameworks, the ability to translate these norms and standards into system-wide analysis planning and programming towards the Sustainable Development Goals. To support this, he commits to improve interagency mobility and ensure it is adequately incentivized — including across United Nations pillars. The reorganizing of the UN Development Coordination Office (DOCO) will now assume managerial and oversight of the Resident Coordinators and it is suggested it should be a standalone office headed by an ASG and directly reporting to the UN Deputy Secretary-General and renamed the UN Sustainable Development Group Office. 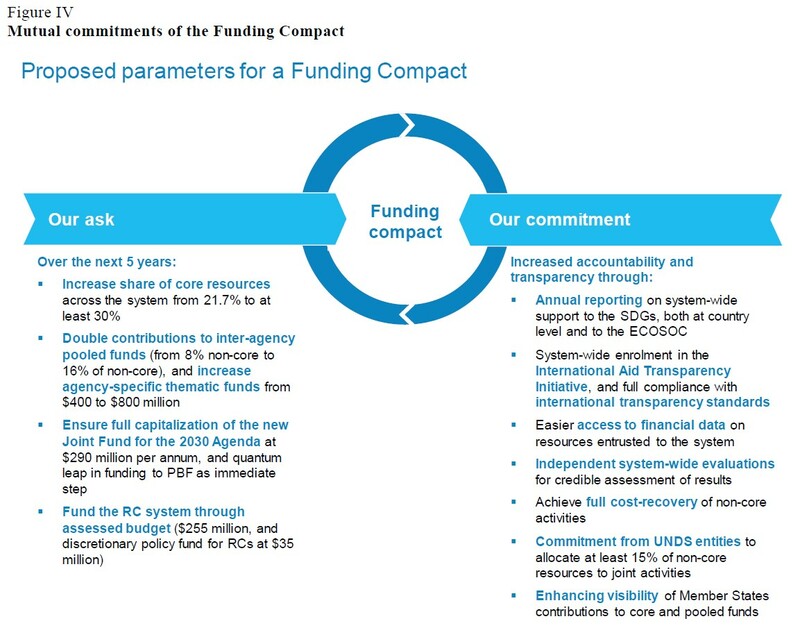 Funding is critical for the success of the reform - here is the propsoed 'compact' between Member States and the UN for delivering . This is an excellent report on a new direction for the UN and should be fully supported by the Member States and stakeholder alike. This will require the Agencies and Programmes to review their strategic plans if it goes ahead and they could look at the approach UNDP are taking as an example of what can be done. If the plan is to reorganize the UN Development Coordination Office (DOCO) a standalone office (and renamed the UN Sustainable Development Group Office) headed by an ASG -- so that it can assume managerial and oversight of the Resident Coordinators -- and given that ALL countries (both Developed and Developing / Emerging / Frontier) that are signatories to the UN Sustainable Development Goals are therefore bound to its implementation, will there also be UN Resident Coordinators assigned to the (so called) "Developed" countries as well, so that there will be some "independent oversight" (monitoring / reporting) of the implementation of the Sustainable Development activities of these (Developed) countries, even in the absence of a specific "demand" or "request" for assistance (under the current UN Development Assistance Framework (UNDAF))? I believe that this could be an important approach since it would hopefully ensure that smaller or less-empowered ethnic or cultural groups that co-exist (peacefully or otherwise) within these 'Developed' countries are not also "marginalized" due to a lack of attention being paid to them by the 'Central Authorities' (governments), such as in the case of (for instance), Indigenous groups in countries like Canada, Australia, Brazil etc.